"I reached a point where I could no longer read the things being said about Sensei Shimabuku, his teachings, or how he promoted his students. The idea that these people felt they knew the way it was to be done, yet never trained under him whizzed me off. I felt it was time the record be set straight." Sensei Shimabuku promoted me to green belt after about 6 months with no testing. He just came up to me and said Harryu you catchy green belt. No big deal I then went and bought one. After another six months the same thing was done when he told me to catchy Black Belt. Upon leaving Okinawa Sensei sat John DeSantis and I down and asked if we were going to teach Isshin Ryu when we went back to the states. At that time I had great hopes of doing just that. Sensei at that time did not promote me to the rank (there is a big difference between a promotion and entrusting) of Roku-Dan, he entrusted it to me. He said after 15 years plus training that it could be used. There was no contract just a handshake and my word. That was good enough at that time. Things do not always turn out the way we plan, for I didn't open a dojo for a long time. After I did and 22 years later I assumed the rank as I felt that I had done as Sensei had asked of me. Now the big question most people want to know, what was my rank when I left Okinawa. I hope that I might have been a half way decent Sho-Dan but that would depend on what standards were used. One thing you will find out is that I will be able to hit someone just as hard with a white obi on as with a black one. If there were any secrets I sure in the hell didn't know any of them. I was neither one of Sensei's favorite or better students. 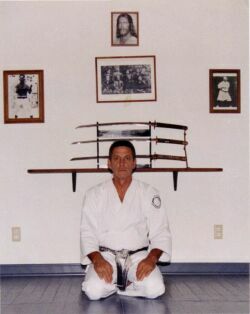 I was just one of many young Marines that passed through the Agena Dojo. Almost everything I was shown was very basic, block, punch and kick. This along with a lot of guts or sometimes no common sense made for some very strong fighters out of the Dojo. There was two things that made a big difference in my personal training after leaving; One was having the code broken down by an Okinawan. The second was working on the Kumite that Sensei taught. Kumite was not sparring but what people now know as bunkai. I have seen a lot of comments made by people about Shimabuku, Sensei. Some have been very good, others question his reasons for the way he developed Isshin Ryu and promoted his students. Sensei was just another person and that means that he made some mistakes but NO ONE knows what his plan was except Tatsuo Shimabuku. A first generation student of Tatsuo Shimabuku and a personal friend to many of us.